Talk about a non-disasticure manicure! I was so nervous to do these nails the other day! When I sat down to do them, I had a clear vision in mind as to what I wanted on my nail. Typically when I do this though, it turns out awful and then 3 manicures later I'm left with something just as bad. 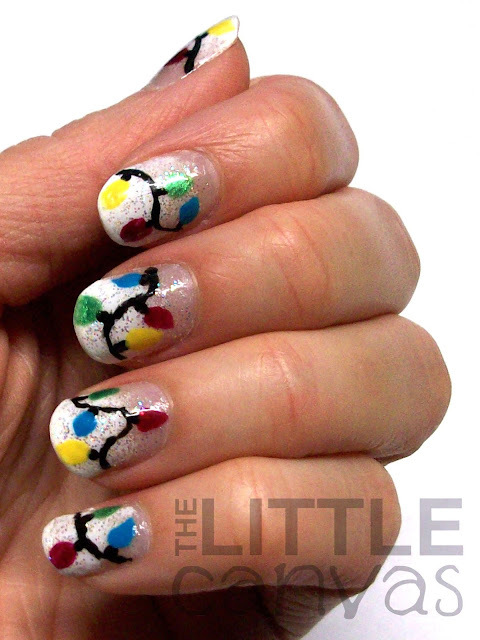 This time around though, my Christmas light manicure came out perfectly and just as I imagined. 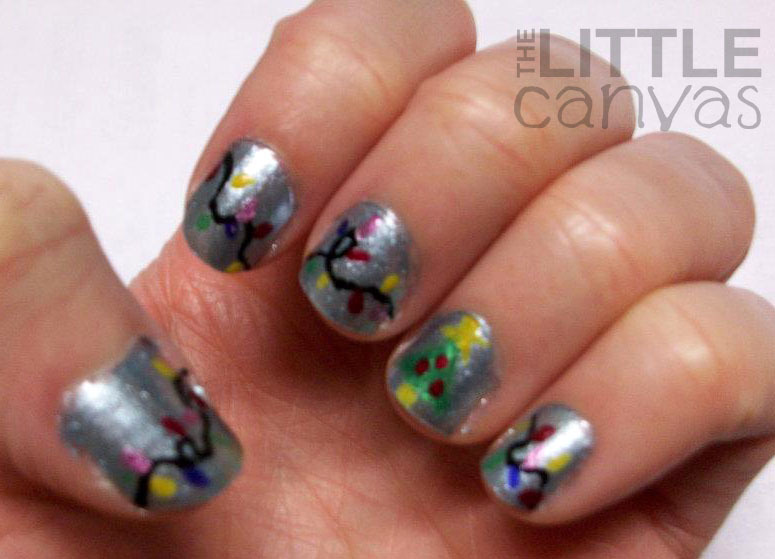 Last year I did Christmas light nails on a baby blue metallic base with an accent nail of a Christmas Tree. I shall include that picture at the end of this post since I did it before I started blogging. I didn't want to do the same thing. I wanted different. I had seen a few white background Christmas light nails but I just wasn't feeling it. I took to the internet and found an idea I liked. 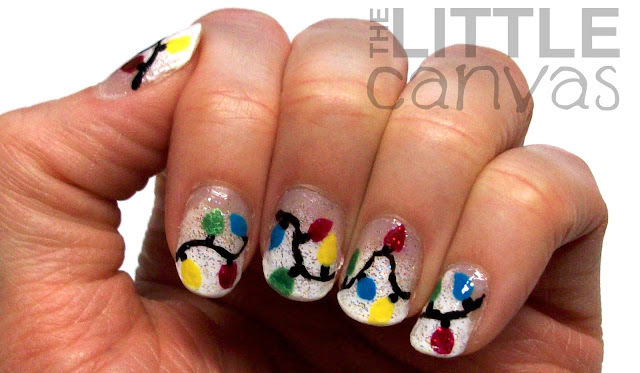 The amazing CutePolish posted a Christmas light manicure awhile back where she painted her nails with a classic french tip and then drew on the strands of lights. This was a decent idea...the full nail wasn't totally white but it was too bare. I then saw her tutorial for birthday nails where she sponged on the french tip. To me, that was perfect, it had the look of falling snow. I didnt want the top of my nail to be bare though, so I went on the perfect glitter hunt. I already owned China Glaze Make a Spectacle, and was debating on using that, but the glitter hexes I feel would have been too big and "swallow up" the lights. Also, it has more of a yellow tinge to the glitter, and well you aren't supposed to play or eat the yellow snow :P. I found a bottle of Sally Hansen Disco Ball and fell in love. It reminded me of NYC White Lights Glitter, one of my favorite glitters that dried up to the point where not even the greatest thinner could save it. I purchased it, and well, even though you can't really see it in the pictures, it was PERFECT for this manicure! Enough of my babbling, picture time. Ulta - well it's yellow and I don't feel like looking it up. <- bad blogger girl. I started off just as cutepolish always does...with a base coat to protect my natural nail. For those of you who watch the videos, you'll understand that lol. Then with a make up sponge, I sponged on the white polish on the tips. I then added 2 coats of Disco Ball to the nails. 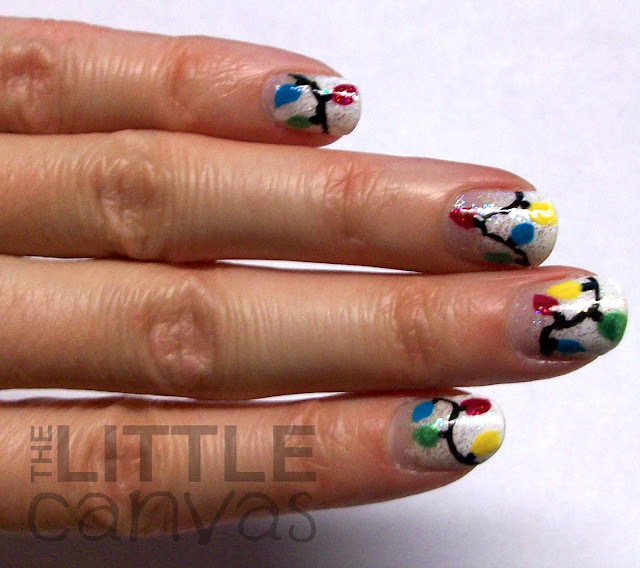 With my nail art brush, I added the light strand and the bulbs. Top coated and done. Easy peasy. These are last years nails, done with all toothpicks. The lights were smaller and my nails nubbier. Can't believe how short my nails were! I clearly did not know how to take photos back then either. I also didn't own a big collection! See how my trunk of my tree was yellow!!! Ohhh those were the days. I don't even think I owned a top coat yet. How I have grown as a nail blogger/artist. Which do you like better....2012's version or 2011's? Personally I like 2012! Glitter, gradient, nail art brushes! 2011's was a great attempt though, not going to lie! Can you predict what I'm going to paint next? See you next post! Thanks!!! Yeah, if the wires are too thick, it doesn't work. I used my thinnest nail brush to get them to look this thin. I still think they could have been a tad smaller, but they turned out good! I'm sure yours werent bad though!!! Thanks Jessica!!!!! Hope you have a happy holiday!